The second ministerial meeting between China and the Community of Latin American and Caribbean States (CELAC) will take place soon in Chile. It will be the first major event in the relations between China and Latin America after the 19th National Congress of the Communist Party of China ended late last year. In February 2010, the 21st Summit of the Rio Group and the second Latin American and Caribbean Summit on Integration and Development were jointly held in Mexico. It was decided that these two organizations will be replaced by a new one called CELAC. In December 2011 it was officially inaugurated. Excluding the United States and Canada in its membership, CELAC seeks to represent the interests of all the 33 countries in Latin America and the Caribbean. As the largest regional bloc in the region, CELAC wishes “to advance social welfare, the quality of life, economic growth, and to promote independent and sustainable development” by ways of promoting political, economic, social and cultural integration. The first China-CELAC ministerial meeting was convened in early 2015 in Beijing. Several important documents were approved and an ambitious road-map of cooperation between the two sides was drawn. The second China-CELAC ministerial meeting will review what has been achieved over the past two years. Undoubtedly, it will contribute to the further development of China's relations with Latin America and the Caribbean. Since the first China-CELAC ministerial meeting in 2015, bilateral ties between the two sides have witnessed great progress. For instance, China published its second policy paper towards Latin America and the Caribbean in November 2016. Compared with the first one, released in 2008, it listed more areas of cooperation between the two sides, including the so-called collective cooperation. By collective cooperation, it means that China would not only work with individual countries, but also promote cooperation with CELAC and other regional organizations. In particular, the policy paper stated that efforts will be made to give full play to the role of such mechanisms as the China-CELAC ministerial meeting, the dialogue of foreign ministers of China and the "Quartet" of CELAC, and the meeting of national coordinators. With Latin America becoming a partner in China's Belt and Road Initiative, Chilean President Bachelet and Argentine President Macri attended the Belt and Road Forum in Beijing in May 2017. They expressed great interest in participating in this initiative, and their Chinese counterpart, President Xi Jinping, extended his warm welcome by announcing that Latin America and the Caribbean would be designated as the natural extension of the 21st Century Maritime Silk Road, one of the two components of the Belt and Road Initiative. For 250 years starting from the second half of the 16th century, Chinese silk and other products were sold to Acapulco, Mexico via the Manila Galleon. Therefore, as many people believe, Latin America's involvement in China's Belt and Road Initiative is just the revival of the ancient trading route. It can be expected that relations between the two sides will be further promoted by the initiative's Five Links (or Wu Tong 五通), i.e., policy coordination, infrastructure connectivity, trade facilitation, financial cooperation and people-to-people exchanges. Over the past two years, areas of cooperation have been expanding. The most notable is the cooperation in productive capacity. In his speech to the United Nations Economic Commission for Latin America and the Caribbean (ECLAC), based in Santiago, Chile, in May 2015, Chinese Premier Li Keqiang called on China and Latin America to enhance cooperation in productive capacity, mainly bringing in industrial facilities, production lines, technology and management experience from China to Latin America. Latin America seems to have a keen interest in engaging itself with China's new idea of cooperation in productive capacity. It is believed that Latin America's not-so-well-developed manufacturing and infrastructure would benefit from its cooperation with China in this field. Needless to say, in order for Latin America to make good use of China's comparative advantage in productive capacity, both sides need to take tangible actions. Particularly, efforts must be made to figure out which projects are most urgently needed. In the first China-CELAC ministerial meeting two years ago, China set out a target for bilateral trade: By 2025, two-way trade between the two sides would reach US$500 billion. However, it suffered a decline in 2015 and 2016. But there will be moderate growth in 2017. In order to realize the US$500 billion target, the remaining seven years must witness stronger growth every year. This is not a small challenge. Due to differences in language, culture and political-economic systems as well as long geographical distance, mutual understanding is always insufficient. Therefore, people-to-people exchanges are greatly needed. In March 2016, the Year of the China-Latin America Cultural Exchanges was kicked off in Beijing. In the biggest-ever all-year-round program between the two sides under the framework of China-CELAC Forum, hundreds of activities, such as art performances, exhibitions, movie screenings, tourism promotions and literary events, were organized to enhance the mutual understanding and friendship. In the diplomatic arena, the most eye-catching event was the establishment of diplomatic relations between China and Panama. Panamanian President Juan Carlos Varela highlighted this diplomatic action as one of the major accomplishments of his past year in office. In November 2017, the leader of the Central American nation paid a week-long visit to China. "I have experienced your national spirit and resilience represented by the Great Wall. 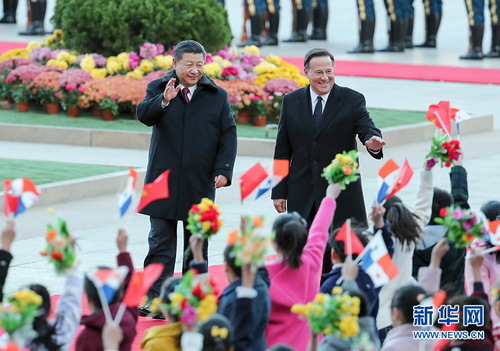 I solemnly reaffirm Panama's adherence to the one-China principle and support for the peaceful reunification of China," President Varela said in Beijing. As China's second policy paper towards Latin America put it, China's development cannot de-link its ties with Latin America and other developing areas. The second China-CELAC ministerial meeting will further strengthen this linkage in the new era of globalization. With differences in language, culture and political-economic systems as well as a long geographical distance, mutual understanding is always insufficient and people-to-people exchanges are greatly needed.